For some reason, the selected default wallpaper is always replaced right after boot. I have already tryed to increase the 'switch wallpaper' setting to 1 day and reduced the amount of installed wallpapers to the minimum (aero wallpaper). No change. My guess is that you are using the Display script to change the wallpaper??? Right? So maybe something in that script??? I use the wallpaper.script to set the default wallpaper and set in Display.script 'Use previously set wallpaper', like always. But in the new version, this leads to the default wallpaper showing up shortly after boot, to then being replaced by another wallpaper, before explorer shell starts. I also have noticed that behavior. Did get the original behavior back by tweaking the settings in the display script. Don't know exactly what I changed. However selecting 'Display wallpaper previously set' was not enough. Here are my currently settings which preserves the original wallpaper. I did a new build. Selected Aero Theme - nature instead of aero. There's definitly something wrong with the new display.script. btw. Noticed the watch gadget is broken. In version 14, a new UX.exe was introduced. It seems to do some new resizing / resetting. If the selected Aero Theme folder contains no images / does not exist, the switching fails and the default wallpaper will not be replaced. btw. The wallpaper strech setting is also reset by the new UX.exe. It does not matter any longer, what one selects in the scripts. I just reproduce, Indeed, seems to be related to the new Ux. For now, it only works if "1. Add only Aero Wallpaper" is defined in addition to "1. Display Wallpaper previously defined". The New Ux allows to resize themes correctly, but I had not seen before, unfortunately we lose the position of the image. Under what cicumstances is there a problem with the themes, during resize? I have never encountered any problem. OK, it seems corrected,with also the picture position (center, stretch, tile). There is no longer choice of : "1. Display Wallpaper previously defined","2. Display Theme Wallpaper". Grouped into theme now : "Wallpaper previously defined",aero,architecture,characters,landscapes,nature,scenes (with other choices visible or not). While we're on the topic of the interface. Is there any specific reason, why there is no option 'Copy no wallpaper'? Already done, choose No wallpaper in the wallpaper script and keep (nothing) it in the display script. 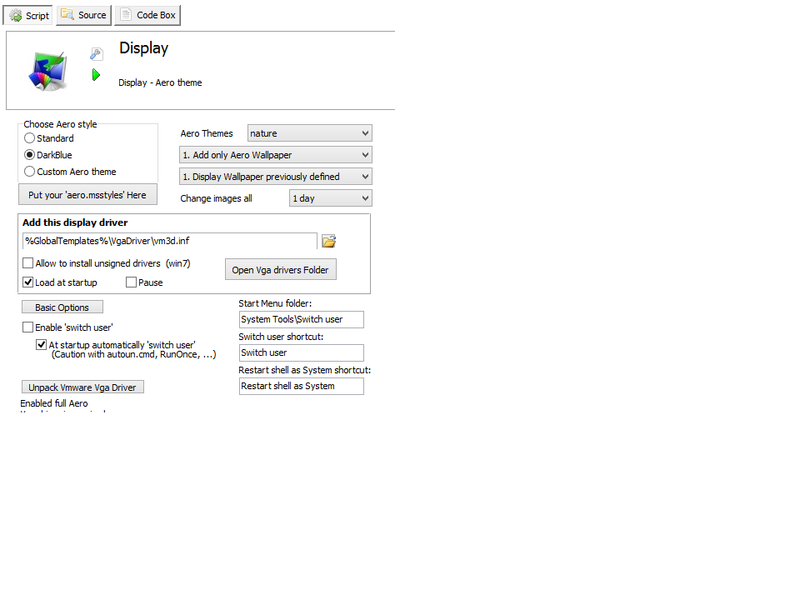 The link above xDisplay_v16 was updated (Slideshow, Picture position and Shuffle image). Hi Chris, i'm a big fan of the new interface. Script works also fine now. PS: The Keyboard switcher has sometimes trouble to show the correct flag right after boot up. Yep, I also saw with the default flag, does not prevent to change keyboards. I'll look when I have some time. I moved its launch from AddAutrun (too early to get the language keyboard) to RunOnce, it seems better. Yep, works for me too. Great job!